The flavor of this salsa bursts with tropical flavors and has a great crunchy and creamy texture! Try as a great garnish for most grilled seafood or serve with tortilla chips for a great snack. 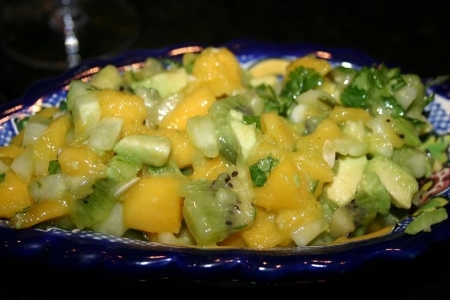 Try pairing the salsa with Grilled Ahi Tuna with a Tropical Fruit and Avocado Cucumber Salsa. In a small mixing bowl combine all ingredients. Mix together and serve with tortilla chips for a snack or as a garnish to complete your grilled seafood.